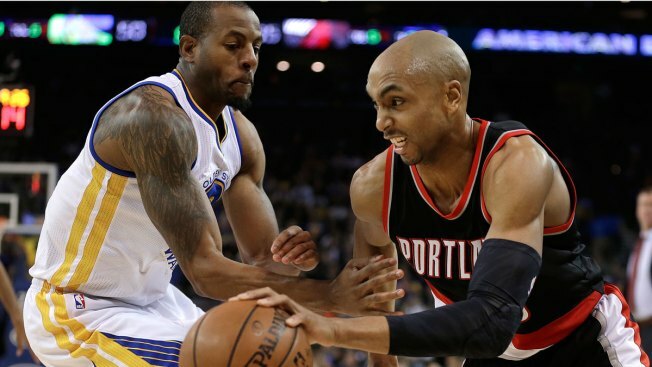 Portland Trail Blazers' Gerald Henderson, right, drives the ball against Golden State Warriors' Andre Iguodala during the first half of an NBA basketball game Friday, March 11, 2016, in Oakland, Calif. The Warriors succeeded Friday night in defending their home court while also avenging their worst defeat of the season. The defending champions lifted their NBA-record home win streak to 47 –- 29-0 this season –- with a 128-112 squelching of the Trail Blazers before a sellout crowd (19,596) at Oracle Arena. Klay Thompson (37 points) and Steph Curry (34) combined for 71 points, as the Warriors achieved a measure of payback for a 137-105 loss to the Blazers on Feb. 19 at Portland. Draymond Green again flirted with a triple-double, finishing with 17 points, a game-high 13 rebounds and a game-high 13 assists to help keep the Warriors (58-6) one game ahead of the record 72-win pace set by the 1995-96 Chicago Bulls. The Warriors (18) and Blazers (19) combined to make 37 3-pointers, the most ever by two teams in an NBA game. The Warriors set a blistering early pace, shooting 58.7 percent in the first half, while holding the Blazers to 44.4 percent. 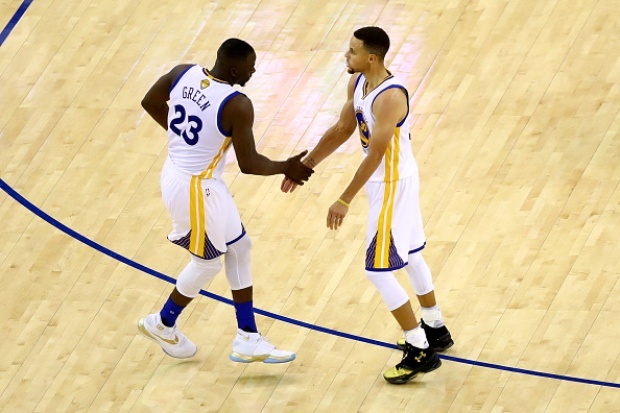 The Warriors tailed off to finish at 44.9 percent, while Portland was at 43 percent. Portland (34-32) was led by guards Damian Lillard (17 points) and C.J. McCollum (18). Lillard, who three weeks ago torched the Warriors for 51 points, finished 5-of-19 from the field (4-of-9 from deep) against alternating defenders Thompson and Curry. It was a Splash Brothers kind of night, with Curry delivering his usual highlights but Thompson having the superior overall game. And Green, too, was strong. Thompson’s line: 37 points (13-of-22 shooting, 8-of-11 beyond the arc) and seven rebounds. He was plus-35 for the night. Curry’s line: 34 points (13-of-23 shooting, 7-of-14 from deep), four assists, three rebounds and two steals. He was plus-13. After Ed Davis made a pair of free throws to cut Portland’s deficit to eight (21-13) with 4:39 left in the first quarter, the Warriors charged back with an 11-4 run –- in only 97 seconds –- to go up 32-17 when Curry drained a 3-pointer with 3:02 left in the quarter. The Warriors maintained a double-digit lead the rest of the game, the Blazers getting no closer than 14 in the second half. Warriors: F Andre Iguodala limped off the floor in the third quarter with an apparent ankle injury and did not return. C Festus Ezeli (L knee surgery) was listed as out. Blazers: No injuries listed and none reported during the game. The Warriors return to action Saturday night, when they play host to the Phoenix Suns at Oracle Arena. Tipoff is scheduled for 7:40.